The fireworks show moves from Ithaca to Dryden this year, and starts at 9:45pm, with parking at 7:30pm. Cathy Wakeman has more on activities this week and beyond. I mentioned earlier that I really like having public meeting minutes available on the town website. Among those minutes are Planning Board minutes. Much as I like having minutes available, sometimes it's easier to gather pieces about one subject into one place. If you're interested, I've pulled the relevant sections - complete sections, no editing - from the Planning Board minutes that talk about the proposed Varna II development. Members Present: Joseph Lalley, Chair; David Weinstein; Joseph Laquatra, Jr.; Megan Whitman; Tom Hatfield, Wendy Martin; Martin Hatch. Others Present: Larry Fabbroni, Stephen Lucente, Tony Busse, Simon St. Laurent, James Skaley. J Lalley opened the meeting at 7:02 pm. On a motion made by Joseph Laquatra and seconded by Wendy Martin, the minutes of the January meeting were approved with the changes sent to P Millard. L Fabbroni introduced Stephen Lucente and Tony Busse who are working on the Varna II project with him. A map was given to the Planning Board members. L Fabbroni described the project as follows: Initially it was designed as a rental project, but has been changed to be a homeowner project. There is a need for housing for the many Cornell employees that commute from Elmira and Cortland every day. This causes a lot of traffic through Dryden. Closer housing will help to alleviate this. The idea is to tie in to the nodal housing concept the County has planned to help revitalize this area. This area has all of the infrastructure and amenities needed to be successful. A brief outline of the project as now proposed was given to the Planning Board members. They would like to build a sustainable, affordable community with easy access to work and services. They could easily tie in to existing bike and pedestrian paths. To minimize surface parking and impervious areas, many units will have garages underneath them. Feedback was solicited from the Planning Board. D Weinstein quoted the Comprehensive Plan asking for limits of no more than 20 units being added to a hamlet area at any one time. He brought up possible limits on the existing sewer infrastructure that may hinder this project. L Fabbroni mentioned that TG Miller stated the existing infrastructure would work if they made sure to run some of the flow to the other side of the road. T Hatfield asked how many total units? 260 plus 30,000 square feet of commercial. What is the time frame? 10 years. That breaks down to 26 units per year if built over 10 years. T Hatfield stated that as a Planning Board, we asked to be able to see units for the entire life of the project . Since the project is projected over 10 years, this does not seem to exceed what the Comprehensive Plan had in mind. Our job is to make sure these presentations fit within a certain criteria and to represent the entire community and let market forces take care of the rest. There is a need. W Martin asked about how the extra traffic would affect the existing traffic patterns in the area. L Fabbroni does have some information on that. There would be an increase and with appropriate bus shelters and turning lanes, it can work. Chair Lalley reminded everyone that this is not a public hearing or even a sketch plan, but just to get an initial conversation started. J Laquatra asked how many phases they were suggesting. L Fabrroni thought 3 phases with commercial not coming in until the second phase. J Lalley asked about the fact that there might be 2 community centers with this project. We would have to flush that out. What about the lot on the opposite side of the street? Could it be used as a park and ride? If we aren't able to work out all of the drainage and retention issues on this side of the road, that piece of property may be used to comply with those regulations. The Planning Board also stated that items such as whether a stop light would end up being needed and leaving some open space in the design are things they will need to see as well. J Laquatra - with this many people walking there would need to be sidewalks in the area as well. L Fabbroni said that is planned as well. There aren't any now. Comments were elicited from the public. Those present asked about fire truck access and mentioned the lower speed limit that was just approved and how that would affect traffic. Would like to get feedback from more longer-term residents and wonder if this would help that. Would they be town roads? No. They would be owned by the home owners' association that would be set up in conjunction with the project. M Hatch asked about the elevation level and slope there. There is a retaining wall set up in the project to handle the change in topography. Chair Lalley asked everyone to keep in mind that reviews done at the Planning Board are done with an open mind. There are rules set for us to follow in the zoning ordinance and development guidelines as well as the comprehensive plan. 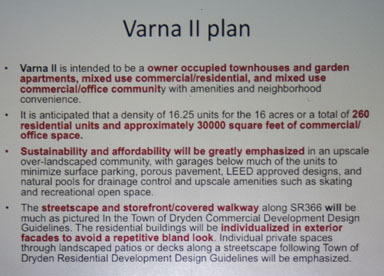 The plan proposed for Varna could be a positive thing for Cornell, the residents of Varna, and the developer. Regardless of whether this project gets approved or not, all projects that come in front of the Planning Board need to be given review in the context of the rules we have. 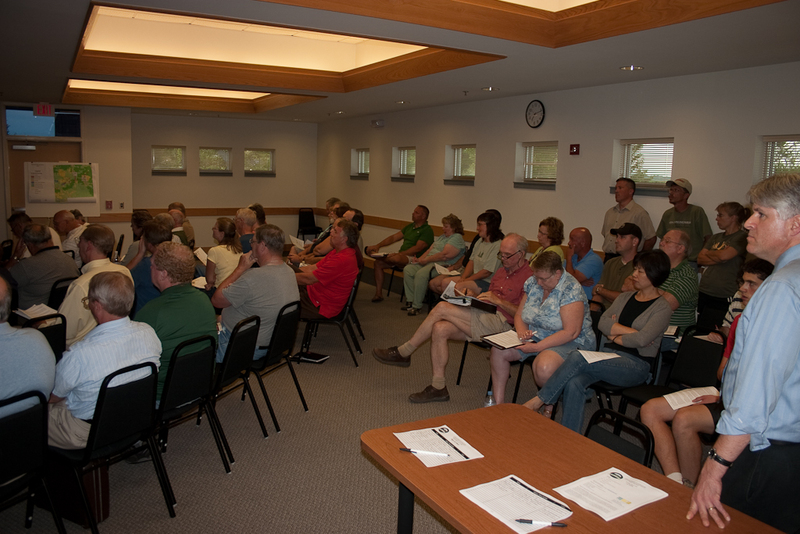 There is interest on the part of Cornell, Lucente, Varna residents and the Town, to sit down and have a conversation about what can be done to help Varna. There is a Varna Community and Commercial Revitalization Plan. Jim Skaley prepared this document and it was passed by The Varna Community Association. It became part of a proposal that was sent in for a Revitalization Grant for the Varna Hamlet area. The document was available to Planning Board members who wished it in hard copy along with a memo summarizing a meeting D Weinstein had with Varna community members today. He will forward the documents electronically to all members. 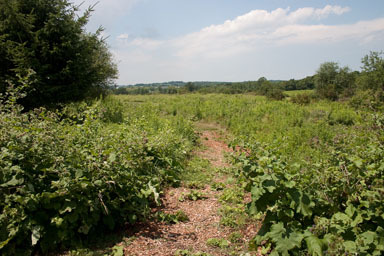 A Hamlet master plan has been suggested as a possible avenue. There may be enough interested parties to fund this work which is estimated to cost $50,000. J Lalley will work on pulling together a meeting within the next 3-4 weeks. Hopefully the timeline can be such that it can be put together in time to be coordinated with the zoning update. J Lalley is still working on putting together a meeting with all interested parties. It did not happen this past month, but is still on his list and a letter will be going out soon inviting all those mentioned last month. D Weinstein handed out a map. The Varna community has already started doing some preliminary planning starting with the document they handed out to the Planning Board last month. The Finger Lakes Land Trust is working on purchasing 170 acres off Irish Settlement Road that includes more than a mile of Six Mile Creek frontage. If all goes well, they plan to add a "parking area, signs, and footbridges". 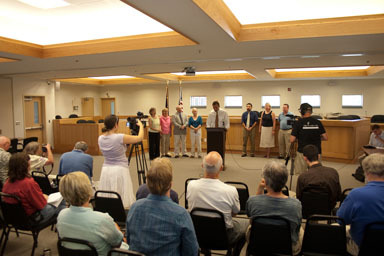 The county also achieved only about 70% of its energy conservation targets between 1998 and 2008. The big celebration will be next year's dedication, but the Southworth Library will be highlighting the start of their new Lincoln Center expansion this Saturday, July 10, at 10:00am. If you'd like to see the beginning of a major project for Dryden's library, come watch! Lucente was invited to present, but instead stayed in the audience, with engineer Larry Fabbroni. Dave Weinstein wound up presenting what's publicly known about the proposal. Lucente and Fabbroni weren't very happy that anyone would present the proposal they made in February, insisting that they were hard at work on something better, but something that wasn't ready yet. He offered no details. Pressed by Tompkins Weekly reporter Nick Babel for a timetable, he said only that "we're getting ready as quickly as we can" and "soon". Jim Skaley opens the conversation. Response to the results of the previous planning for Varna meeting was generally positive, though most of that positivity came from the Varna residents who'd helped create it. There were two large though not really unexpected elephants in the room: the road (Route 366), and Cornell. Larry Fabbroni suggested that Cornell's 200-year plan involves owning all of this area eventually. I don't remember seeing that in the master plan. David Weinstein pointed out that new residential development can be a net tax expense for an area, not simply growth in the tax base. An excerpt of the new draft zoning Dave Weinstein showed in a slide suggested that the new zoning tilts further to higher density development than the previous draft, jumping the hamlet zone from a 4 units/acre maximum to a 10 units/acre maximum. I don't yet see that new draft posted, though. Lucente said proudly that "I have a plan for everything. If I have something left [ugly] I'm going to replace it with something better." 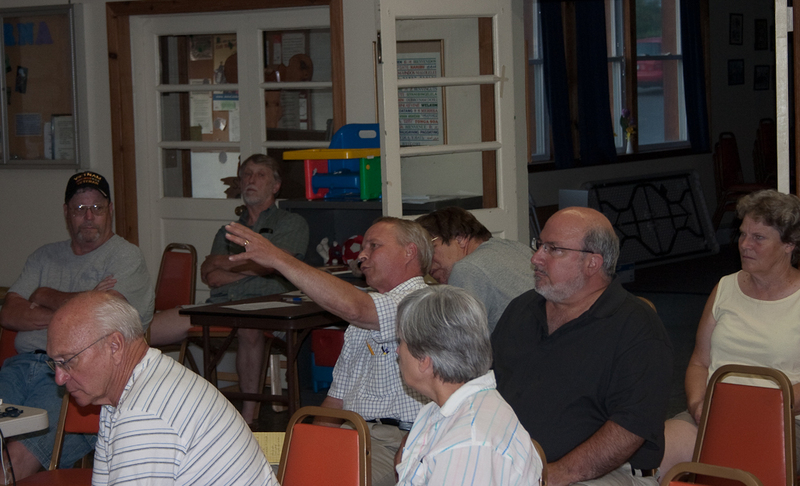 That didn't sit well with residents, who asked some pointed questions about specific properties. Lucente did offer a complete list of his properties and a tour of them to questioners. Although the project is described as owner-occupied, there was mention of a "transition" rental period. They were now talking about sale prices in a range from $150K to $200K, not the $220K mentioned at the February Planning Board meeting. Larry Fabbroni responds to resident questions. David Weinstein did present a slide that contained more information than I'd gleaned from the Planning Board meeting. Among other things it noted a possibility of "LEED-approved designs", though not which level of certification. I'll have a lot more on all of this as I find time to write about it. Tour 5 Historic Gardens for $5. Original Artwork for sale in each garden. Tickets and Starting Point: Municipal Parking Lot on George Street. Maps available the day of the tour. Walk or ride the free shuttle to each garden. 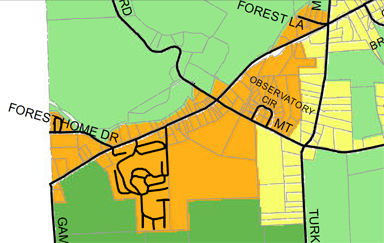 Just in time for the weekend, the Town has posted new drafts of the zoning ordinance and map. There will be a public meeting to discuss them at the Dryden Town Hall, 93 East Main Street (Route 392), in Dryden on Thursday, July 22nd at 7:00pm. Yes, they have air-conditioning! I'll have more to say when I've had a chance to review them. NYSEG rates will be going up around 9%, and Congressman Arcuri faces a tough race this November. The Journal published a lot on the cost of county government, noting ways in which winter's unpredictability makes for difficult budgeting, public safety is always a challenge, and the library avoids overtime. There's also a piece on Forest Home, just west of Varna, and how its older houses are central to its charm and property values. And finally, State budget? What budget? Yes, it could be worse. We could be in Illinois. I fear we may be there soon enough, though. That was quick: Fire at officer's home ruled arson. State fire investigators, with the aid of City of Ithaca fire investigators and the State Police Forensic Identification Unit, conducted an investigation Sunday into the blaze's cause. State police are now conducting a criminal investigation with the assistance of the City of Ithaca Police Department, Tompkins County Sheriff's Department, Tompkins County District Attorney's Office and Ithaca College Public Safety. as well as the war on selling eggs from your house. Rural residential zones seem to be designed for a very quiet vision of suburbia. Update: clarification of accessory uses and the separation of the most restricted approach into the "neighborhood residential" zone seems to indicate a truce in this war. Workshop/Garage - Non-Commercial - A structure used for the conduct of non-commercial, low-intensity activities such as woodworking, personal vehicle repair, and storage. Artist Studio/ Craft Workshop - A place where artists, artisans, craftsman and other skilled tradespeople produce custom-made art or craft products, where they teach such skills, and/or where they sell such products. Isn't woodworking pretty much the archetypal suburban hobby? Well, at least they didn't ban gardening. The war on selling agricultural produce from your house also continues. You can raise all the chickens you want, but don't try selling them! That's an Agriculture Related Enterprise ("Wholesale or retail sale of grain, fruit, produce, trees, shrubs, flowers or other products of local agricultural operations. "), forbidden in Rural Residential. You can see the map here to figure out if you're in rural residential. Lots of residents are. I did write the Town about these issues, but apparently to no effect. Maybe I'll write the paper instead. Cathy Wakeman's Dryden Town Talk has all kinds of news, leading with the Dryden Beautification Brigade's upcoming garden tour this Saturday morning. She also notes the new Dryden Methodist Church pastor, the Southworth Library's groundbreaking for its expansion, Eagle Scouts, and Dryden Youth Football camp. There's one pleasant fiscal surprise at the county level: sales tax revenue is up. The Varna Volunteer Fire Company helped organize a cleanup at the burned Bryan Bangs house, clearing the debris and wreckage from this weekend's arson. In other news, the Varna Community Sale Day will be this Saturday, July 17th, from 8:00am to 3:00pm, with rummage sales around the hamlet and barbecue and hot dogs available after noon. The Varna United Methodist Church will be opening its own flea sale (and selling sundaes!) at 11:00am. On the state level, Empire Zones are dead, replaced by Excelsior Jobs. Old Empire Zone residents don't lose their benefits, many of which I don't think accomplished much, but I'll be curious to see what comes of the new program and what it actually means. I've had a few people over the past few days ask me something like "you don't really like the new draft zoning, do you?" In general, I'm afraid they're right. The hamlet zoning density blasted up from a little over four to as much as ten units per acre, while still specifying, well, little vision for what a hamlet should look like. They also pulled the hamlet designation from Etna and McLean, leaving it only in Varna. Perhaps they knew the new version wouldn't make Etna or McLean residents excited supporters of either the zoning or future water and sewer infrastructure. The commercial zoning now supports residential densities cranked up much like those proposed for hamlets, and I'm not sure that's really what most people had in mind when commercial zones were discussed earlier. There's mixed use, and then there's apartment complexes. They're not the same thing. I didn't love the description of Conservation zones in the previous version - it was more complex than I'd really like. A somewhat similar proposal had been dropped from the Comprehensive Plan's discussion of subdivision. This new version, though, seems to make Conservation zones impossible to understand without walking through a long series of examples on specific parcels with particular constraints. It seems very different from the calculations for the other zones, enough that it's hard to compare its results. I'd encourage everyone with a bit of time to read the new drafts and study the new map, and come to your own conclusions. I hope (and expect) they'll be different from mine. My own conclusion is that there's no way at all I can support this new draft. It wrecks the parts I felt most valuable while complicating other issues. I recognize that the current zoning is a mess, but every meeting about this has emphasized that it's something we want to get right and then not mess with for a while. At this point, I think that "getting it right" has to mean taking another look rather than rushing to pass a broken law. I don't want to have to spend the next few decades cleaning up the mess this seems likely to create. The challenges of "in-between densities"
Density is a strange word, especially as a description of human settlement. It's a planner's abstraction, a quick way of saying how many houses, apartments, or sometimes people are placed in an area. After decades of Americans seeking out places to live at lower density, we seem to be in a period of reversal, where higher densities are somewhat more popular and definitely promoted as more virtuous. I don't think, though, that either pole - "low density is good" or "high density is good" - really captures the dynamics of how people actually live in housing of various densities. It's far more complicated than that, which unfortunately will make this post longer than I'd like it to be. That complication, though, is at the heart of a lot of conversation. Something happens between those densities and the intense density of a big city, though. I quoted Jane Jacobs' Death and Life of Great American Cities earlier about the importance of neighborhoods, but she also has something to say about the transition from lower densities to higher ones that rings true even in the much smaller-scale world along Dryden Road, from Route 13 to Collegetown. We ought to look at densities in much the same way we look at calories and vitamins. Right amounts are right amounts because of how they perform. And what is right differs in specific instances. Let us begin at the low end of the density scale [not exactly, by Dryden standards, but...] to understand, broadly, why a density that may perform well in one place is poor in another. Very low densities, six dwellings or fewer to the net acre, can make out well in suburbs. Lots at such densities average, say, 70 by 100 feet or more. Some suburban densities go higher, of course; lots at ten dwellings to the acre average just under, say, 50 by 90 feet, which is a squeeze for suburban living but, with clever site planning, good design and genuine suburban location, can yield a suburb or a reasonable facsimile. Between ten and twenty dwellings to the acre yields a kind of semisuburb [the Garden City ideal was around 12], consisting either of detached or two-family houses on handkerchief plots, or else of generously sized row houses with relatively generous yards or greens. These arrangements, although they are apt to be dull, can be viable and safe if they are secluded from city life; for example, if they lie toward the outer edges of a big city. They will not generate city liveliness or public life - their populations are too thin - nor will they help maintain city sidewalk safety. But there may be no need for them to do so. However, densities of this kind ringing a city are a bad long-term bet, destined to become a gray area. As the city continues to grow, the character that makes these semisuburbs attractive and functional is lost. As they are engulfed and embedded deep in a city, they lose, of course, their former geographical closeness to true suburbs or countryside. But more than that, they lose their protection from people who do not "fit in" to each other's private lives economically, and they lose their aloofness from the peculiar problems of city life. Swallowed in a city and its ordinary problems, they possess no city vitality to contend with these problems. Unfortunately, however, densities high enough to bring with them innate city problems are not by any means necessarily high enough to do their share in producing city liveliness, safety, convenience, and interest. And so, between the point where semi-suburban character and function are lost, and the point at which lively diversity and public life can arise, lies a range of big-city densities that I shall call "in-between" densities. They are fit neither for suburban life nor for city life. They are fit, generally, for nothing but trouble. For successful city life, she sees around 100 units per acre as a key point for vitality, a long way from the 100 acres per unit this story started with. The part that most interests me here, though, is the notion of "in-between" densities, a range of densities that create problems without creating solutions for them. At low densities - below the roughly 6 dwellings per acre she cites in an age where citizens were perhaps more fond of density - 'city problems' don't really happen. At 10 dwellings per acre, it's more difficult: "clever site planning, good design and genuine suburban location, can yield a suburb or a reasonable facsimile". apt to be dull... will not generate city liveliness or public life... nor will they help maintain city sidewalk safety... a bad long-term bet, destined to become a gray area... lose their protection from people who do not "fit in" to each other's private lives economically, and they lose their aloofness from the peculiar problems of city life.. they possess no city vitality to contend with these problems. And densities between there and much much denser are "nothing but trouble", unless some other positive features can save them. When residents worry about increasing density above 8-10 dwellings per acre, it's not just that they know less than the wise planners encouraging density. It's that they can feel the challenges to come. I'm happy to see that NYSEG is now seeking yet smaller rate increases for service, 1.3% this year and 2.3% the next two years for gas, and 2.1% in 2010 and 2.2% the next two years for electricity. In county news, we'll have a Democratic primary for sheriff, though I haven't heard of any Republican candidates. Also, legislators seem to be sorting out record-keeping issues. Upstate New York suffers from an especially strong version of sprawl, in which there isn't much population growth but residents abandon cities for the suburbs. The wasted infrastructures costs of this are especially dire. Rolf Pendall of Cornell's Department of City and Regional Planning wrote a classic Brookings paper on how this looks in Upstate. Gas and road maintenance prices have spiked recently, and there's cause for concern that they'll continue to climb in the long term. This makes scattered housing more expensive both for its residents and for local government. No one has the tools to force density back into the City of Ithaca. County Planning has no land-use authority. The City can promote itself, but promotion alone hasn't kept Tompkins County residents in its urban core. The proposed answer to higher gas prices is more public transit. The old trolley system (and the old rail lines) can't be an option, though, as there isn't enough density even in the City to support them. Instead, the answer is buses. I keep hearing that buses need concentrated densities of 16 dwellings/acre are necessary to make transit generally profitable. 16 dwellings per acre simply isn't generally going to happen when houses are built gradually by people making their own choices about what to create. Outside of Ecovillage, which is dense clusters surrounded by countryside, even the idea of shared walls and duplexes makes a property more a specialty item. The kinds of density needed to support transit are only possible in areas with water and sewer systems, for public healty reasons. Those tend to be in places that had sufficient density already to make installing them a worthwhile investment, so those become candidates for 'nodes'. By expanding the 'node' story beyond the City of Ithaca and the villages, County Planning can say to the rural towns that this isn't a plot to constrain their growth and their tax base - it's an opportunity for them to grow. Because of the nature of the density proposed, these kinds of developments aren't going to be built by homeowners or even likely small builders. They'll be larger projects, centrally managed and financed. This leads to things like the Route 13/366 Corridor Study. I remember asking a well-intentioned person why anyone would want to live in the proposed node along the Route 13/366 overlap, suggesting that it wouldn't ever get built. The response was "well, if we can find someone to take on a really big project..." For all that change, we'd see a grand total of maybe a 10% reduction in gasoline use. Somehow, I don't think these proposals solve that problem well enough to cover the costs of the additional problems they create. I just had a very strange conversation that started with a complaint that Varna residents hadn't spent enough time discussing the future of the hamlet. That shocked me almost as much as someone else's claim that dense development was what the Comprehensive Plan recommended for the area. The 1999 Varna Community and Commercial Revitalization Plan, done as part of a county grant, substantial pieces of which have been realized. 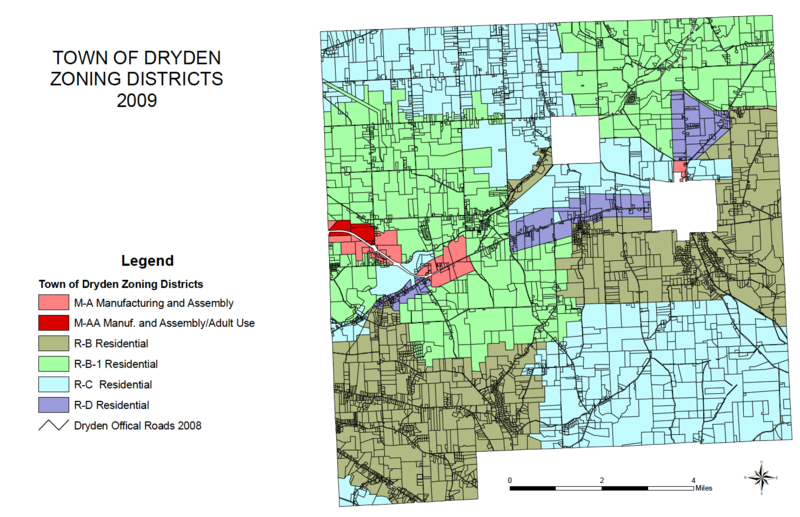 The 2005 Town of Dryden Comprehensive Plan, which was a much longer conversation over many years and meetings. 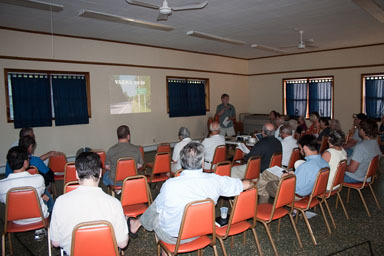 The Route 13/366 Corridor Study, a county-sponsored nodal-development-promoting project in 2007. The Cornell-sponsored Transportation-focused Generic Environmental Impact Statement, which was much broader in scope but certainly received lots of Varna input and participation. Recent zoning proposals, which seemed to reflect resident preferences up until about the last draft. I can't say those projects were all of equal value, but there's certainly been no shortage of conversation. I've also heard enough stories from Varna folks about the earlier 1968 Town Comprehensive Plan, the earlier zoning, and various issues around mobile home development to feel certain that these conversations were going on long before I got here. For an unincorporated place with no way to enforce its decisions, it's a huge amount of ongoing conversation. Update: Just for completeness, I should note the two most recent Varna planning results: the Varna 20-20 summary and the proposed alternate zoning. The Tompkins County Highway Department will be hosting a meeting on the rebuilding of Ellis Hollow Road tonight at 7:00pm at the Ellis Hollow Community Center on Genung Road. I thought I'd posted this earlier, but apparently not - sorry for the late notice! After seven years, the spam comments on this site have completely overwhelmed me. I've kept up with good comments (I hope) through email, but I still have 13500+ spam comments to delete from the web interface (a hundred at a time! ), and that's only about a month's worth. I dislike CAPTCHAs, those odd shaded "type in these characters to leave a comment" thing - they're ugly, they're inaccessible to a lot of readers, and they're generally a pain in the neck. They don't stop all spam, either, though they seem to cut the volume down a lot. I have a bit of reformatting to do, but eventually it should look okay. For now, I just need this to work! We've had a few good conversations break out here over the past few months, and hopefully this will make it easier for me to encourage them. If you have difficulties, please contact me at simonstl at simonstl dot com. "I expect a lot more to be coming out in the next two to three weeks," Fabbroni said. "People will really see how impressive the project is and how it will breathe new life into Varna." The Journal doesn't mention the questions at the July 7th meeting about how Lucente's general lack of management of his existing Varna properties keeps new life in Varna down, but that does come up in the Tompkins Weekly article (4.8 MB PDF) on the meeting. State Senator Seward filed re-election petitions. So far as I know, he has no opponents. TC3 will be holding a blood drive next Wednesday, the 28th. Just across the town line, Hanshaw Road residents are considering legal action against the County over the expansion of Hanshaw Road. I have to say that reading the whole article raises lots of doubts for me about the wisdom of the County and the State - I'm not really sure why they're so excited about widening roads in places that already have speed problems. Varna residents came together a few times over the last few weeks to outline a vision for the hamlet. This document is the result of the June 21st meeting, and was sent out to all participants. It's a worthy addition to the library of Varna planning. 38 Varna residents and business owners attended a meeting to discuss what they would like to see for Varna over the next 10 to 20 years. The meeting included residents from a large cross-section of local neighborhoods including Hillside Acres, Turkey Hill, Freese Rd, Mt Pleasant and Observatory Circle and Dryden Rd (Rt 366) stretching from the 800's to 1200's with most of the residents coming from the 900's section of Dryden Rd. Overall, residents felt some gradual development that did not ruin the current rural character of the community would be acceptable. Development should be based on "smart growth principles" with an emphasis on gathering places for adults and children, pedestrian and bike safety, affordable and attractive, owner-occupied single family homes with a focus on walkable neighborhoods and an ability to congregate at coffee/ice cream shops and eating places so that neighbors can reconnect with other neighbors in the hamlet. Mini-Mart (place to purchase small essential items such as milk/bread), coffee shop (sit-down for local conversation), ice-cream shop, pizza-takeout, small scale shops rather than big commercial stores, most of above might be combined offerings in a few small businesses. 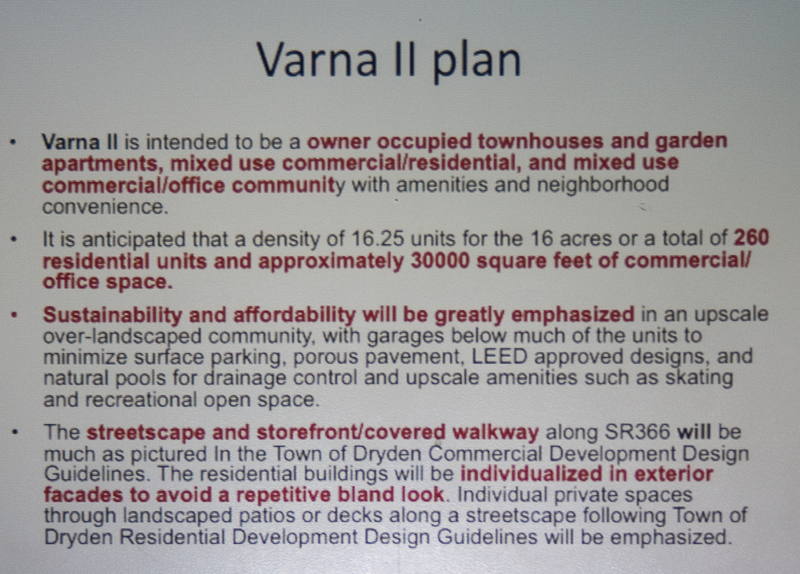 Growth is OK, but doubling size of Varna in ten years is "over the top"
You can see the new draft zoning proposals on the Town website, and there will be a meeting to discuss them this Thursday, July 22nd, at 7:00pm at the Dryden Town Hall, 93 East Main Street (Route 392), in Dryden. If there's a conversation that may determine the future of the Town for the next few decades, this is it. I was writing a larger piece about the changes to the hamlet and commercial zones in the latest release of the proposed Town of Dryden zoning law, but I realized that the map changes are big enough to be worth noting by themselves. The commercial zones have grown, while the hamlet zones have shrunk. The hamlet zone is now just Varna - which I guess makes it harder to rally opposition to these changes from Etna and McLean. It also no longer includes most of the properties along Turkey Hill Road. The commercial zone at the 13/366 intersection has expanded significantly westward, from the Orchid Place, to around 1230 Dryden Road, including Cornell Plantations land. The commercial zone on Johnson Road expanded to its north almost to the Village of Freeville. There are small new spots of commercial zoning north of 13 along the Village of Dryden's western boundary, as well as on 38 just west of the Village of Dryden. A big chunk of land to the north and east of the Village of Dryden along Route 13 that had been marked Rural Residential is now marked commercial as well. These are not small changes. I definitely encourage everyone to look at the latest map. Update: A new map has arrived (PDF version). It doesn't appear to change the commercial zones, but I realize I missed some small spots on Route 38 north of Freeville. There definitely is some "spot zoning" in this document. Sections 605 and 606, which cover areas with water and sewer, are very similar tables, which I've combined below for easy comparison. Multi-Family Rental, attached 8 Limit of 20 units per building. Multi-Family Townhome or Condominium 10 Limit of 20 units per building. units per building (or series of buildings). Multi-Family Detached 8 Limit of 16 individual buildings per development. Individual Single Family Homes 4 70% Lot Coverage Limit 4 70% Green Space. maximum 30 units per building. It's hard to know where to begin, because so much has changed from "4.35 units per acre". The limits "per building" don't seem likely to accomplish much, but I'm guessing it's a way of nodding in the direction of the "multiunit developments should be limited to a maximum of 20 units" of the Comprehensive Plan without actually doing anything about it. They also sometimes recommend the use of PUD - Planned Unit Development Districts, §1000 of the draft - without requiring them. §501 In the H District any use that includes a structure or structures larger than 10,000 sf requires a Special Use Permit. In the CC and LIO Districts, any use that includes a structure larger than 20,000 sf requires a Special Use Permit. Agricultural structures directly related to an agricultural use shall be exempt from such size limits. There are also lots of map changes, expanding the commercial zone and shrinking the hamlet zone to a smaller piece of Varna. My cynical side wonders if the higher densities in the hamlet are an effort to negotiate with Stephen Lucente over his Varna project's density. He wants 16, existing zoning permits 14.5, and this would allow him 10, plus a much more leisurely application process. I'm guessing that's not it, though. Building such negotiations into the zoning code is a bad idea, and it doesn't sound like a density Lucente is interested in. It does feel, unfortunately, like the Planning Board felt prodded to crank up the density after that proposal arrived. Overall, this draft offers developers lots of opportunities to build higher density in places where residents won't have a whole lot of activity immediately available, along roads that already feel congested. Though it may derive from "nodal development" ideas, it looks a lot more like "lumpy sprawl". While I've been marveling at the awfulness of the broad hamlet zoning proposed in the second draft of the law, Jim Skaley's been developing a proposal that does more than say "revert back to the first draft." Skaley saw the huge undifferentiated splotch of hamlet zoning as something that could be improved upon. Undifferentiated hamlet zoning - a big blob of goldenrod color. He knew from his previous planning experiences that it's possible to zone hamlets much more precisely, and spoke at the July 7th Varna discussion of other hamlets that have gone that route, including Cheshire, in the Town of Canandaigua (19.3MB PDF), Jamesville, in the Town of DeWitt, and the Town of Wilton (725KB PDF), over in Saratoga County. Building on the Varna 20-20 discussions and through conversations with lots of Varna residents, Skaley created a much more detailed map and plan for the hamlet. This seems like a vast improvement on both the original draft of the zoning and the revised draft to me. I do have one minor doubt, most notably the discussion of the road, and I'd exclude fewer Cornell properties from development. Overall, though this feels like it actually describes a functioning hamlet and not just a "we hope something happens here" scenario. There's power in those details that could help Varna tremendously. He's sent this to the Planning Board, and I hope they'll take it seriously. Residents of Varna, the Varna Revitalization Committee, and the Varna Community Association, have crafted the following recommendations to assure that the proposed zoning guides gradual development that preserves the current rural character of the community. Development should be based on "smart growth principles" with an emphasis on gathering places for adults and children, pedestrian and bike safety, affordable and attractive, owner-occupied single family homes with a focus on walkable neighborhoods and an ability to congregate at coffee/ice cream shops and eating places so that neighbors can reconnect with other neighbors in the hamlet. A major redesign of Route 366 as it passes through the hamlet should be initiated. There is ample space to implement the "main street" concept stated in the Comprehensive Plan for Varna. The NY State Route 366 has 50' right of way, including two 11' traffic lanes. That leaves enough space for two 4' sidewalks, a 5' bike lane and 7' parallel parking on one side. An attractive addition would be to build a 4' center median gateway at the east and west ends of Varna as a further device to calm traffic. Funds should be applied for to permit reengineering of the road along the lines of this design. This plan would leave enough space for a small berm above the curb and border for adjacent property. Varna is included in the Metropolitan Planning Organization (MPO), which coordinates and sets priorities for transportation projects within the urbanized area in Tompkins County. A Revitalized Neighborhood Commercial Center zone should be located around the intersection of Freese and Mt Pleasant roads, an appropriate location given that there are already current commercial uses in this area. This could be accomplished by designating this section of the hamlet as one of the town's commercial districts. Although it is desirable to have a mixture of commercial and residential uses in the hamlet, permitting commercial uses to be sited anywhere within the hamlet and along main street (RT 366) will encourage strip development and will discourage cohesive neighborhood residential development that would be attractive to families seeking an attractive livable community. There is interest in extending the proposed zone along Rt 366 by current owners as indicated on the map to allow for development of a coffee shop and dine-in/takeout eating establishment. Such a neighborhood commercial zone (approximating 5 acres) would focus activity for both car and foot traffic to a centralized location. Therefore, zoning should designate a commercial node at the intersection of Route 366 and Freese Rd/Mt Pleasant Rd (see attached map) with commercial (e.g. retail shops) restricted elsewhere in the designated residential areas. This would increase the potential for increased foot traffic to all the related commercial establishments facilitating the likelihood of commercial successes. Currently, there already exist within this proposed zone nearby apartments that would offer immediate foot traffic. Likewise, this location is easily within walking distance of local neighborhoods extending to the west along Rt 366 and to the north and south along Freese and Mt Pleasant roads including residents along Turkey Hill Rd. This would also disallow commercial development within existing residential neighborhoods except as provided for such as professional offices that are in conformance with the existing residential guidelines as appended to the ordinance. Current non-conforming uses would revert to the proposed zone should there be a change in ownership, proposed use or abandonment. The Town of Dryden should encourage development of the revitalized commercial zone by soliciting assistance of TCAD, County Planning and /or the IDA in attracting commercial developer who would work with the Town and the Hamlet in proposing commercial activities that would be commercially viable for the community. Zoning in the hamlet must restrict residential development to small-scale projects scattered throughout the hamlet of Varna, as broadly defined, interspersed with single-family homes. These developments should be designed to help meet the goal of increasing the proportion of owner-occupied homes compared to rental units. Such guidelines are necessary to support the desire of residents to allow construction of developments that do not unfairly diminish their quality of life and impact property values. Residents presently enjoy the rural feeling and accompanying density of the current hamlet of 2.5 units per acre, but support a gradual change toward a density of 4 to 5 units per acre (the current density of the Hillside manufactured home park) on average throughout the hamlet over the next twenty years, with no parcel exceeding twice this density. The long-term plan for the hamlet should include two or three mixed commercial/residential developments, containing 10 residential units each, two or three townhouse developments, scattered throughout the main part of the hamlet, containing 10 to 20 residential units each, and 20 to 30 single family homes interspersed between the more dense developments and on the bluff that parallels Rt 366 in the hamlet and to its south. Residents feel that in order to maintain the quality of life and character of the community, an upper limit of growth would be the addition of 100 units over the next 20 years. To promote single family use, the baseline use in the hamlet district. Change of use of current non-conforming housing or new construction within residential zones should be to single-family occupancy. As properties currently used for commercial purposes outside of the designated commercial district discussed above change ownership, uses should revert to single-family occupancy. A valid occupancy permit would not be affected; nor would property transfers or sale be affected so long as the use remains the same. Commercial activity in existing residential neighborhoods would be disallowed except as provided for elsewhere in the ordinance (such as Home occupancy level1 and level 2 and professional offices) that is in conformance with the existing residential guidelines as appended to the ordinance. Residents are already experiencing periodic backups in the sewer system. Those with long -term knowledge of the system understand that there is inadequate sewer capacity for large expansion of use of this system, in either the volume of waste the current pipes can handle, the deteriorated condition of those pipes, and the age of the pumping station. Insufficient capacity is available to handle more than 100 new units of expansion over the next twenty years without incurring major new repair costs and increased sewer use assessments. A single large-scale development that would use up the available capacity in the sewer/water district should be restricted. Therefore, in order to promote diverse residential developments throughout Varna (defined as the area from Game Farm to RT 13 intersection and adjacent areas on Freese, Mt Pleasant and Turkey Hill roads), a variety of small-scale complexes including multi-family and townhouse developments should be scattered throughout the hamlet. A Planned Development Residential (PDR) zone should be added for proposed developments. Such a zone specifically relates to residential development whereas, the PUD may incorporate any number of unrelated options. A PDR allows for design flexibility intended to encourage efficient use of the land and public services and to promote high quality design that will provide a variety of dwelling types as well as adequate support services and open space for residents of the development. The PDR zone would be used to complement higher density residential areas within the hamlet zone. Cornell Lands within the hamlet should be designated as University/agriculture/natural area (UAg) to insure that these parcels continue to contribute open space to the community. Commercial buildings should conform in scale, façade, setbacks and parking to the surrounding neighborhood character and in conformance with the commercial guidelines appended to the ordinance. A traffic light should be installed at the intersection of Route 366 and Freese Rd/Mt Pleasant. Left turns at the intersection are becoming increasingly difficult and dangerous to make, particularly for those entering the intersection from Mt Pleasant Rd and, especially from Freese Rd. Update: Per Dan's comment below, a new map has arrived (PDF version). The OTNDOs appear to be the Etna hamlet core and some areas east and south of the Village of Dryden. 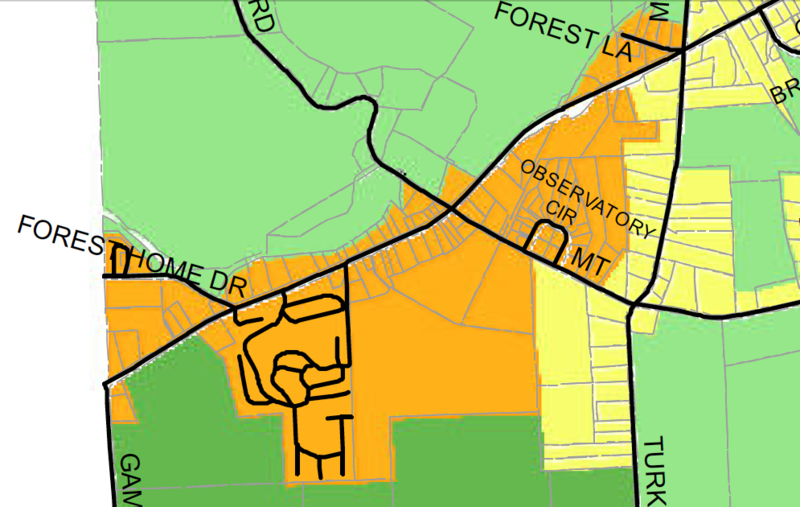 The McLean area doesn't have it marked, and neither do most other areas that were previously marked. I wondered earlier what was up with the text of the draft talking about Optional Traditional Neighborhood Development Overlay Districts (OTNDO) as if they were on the map, but the map not showing them. I wrote the Town to find out, and apparently they are supposed to be on the map. If you're thinking "I'm in rural residential, and most of this doesn't apply to me", you may want to wait and see the next release of the map. Of course, even though OTNDO districts might be on the map, they're only fully functional in areas with water districts. I'll update this as soon as I see an updated map on the Town site. You can see the new draft zoning proposals on the Town website, and there will be a meeting to discuss them this tonight, July 22nd, at 7:00pm at the Dryden Town Hall, 93 East Main Street (Route 392), in Dryden. This is likely the last opportunity for public comment before the Planning Board. Future steps will be with the Town Board, likely in a more formal setting. Last night's public meeting on the new draft of the zoning law was pretty different from the meetings (1 2) on the earlier draft. While the earlier meetings had included a fair number of "we need this zoning" and "I could almost support this" kinds of comments, last night's comments were almost universally of the "too much here is wrong" variety. Part of the crowd at zoning meeting. "Devote yourselves to Varna, because I think the rest of the Town needs some more time on this." I'd estimate that about three-quarters of the comments were either from Varna residents asking for more precise zoning or from people asking for far less zoning. While there's an argument that making both sides annoyed is a good sign of compromise, that really didn't seem to operate last night. Many of the folks talking about the law being too restrictive also seemed supportive of taking a closer look at Varna, and the Varna residents didn't call for a rush to pass the current zoning either. "Some people seem to think of Varna as a problem that needs to be fixed. Varna is not a problem. The road that goes through Varna is a problem that needs to be fixed." Environmental Planner Dan Kwasnowski mentioned the possibility of further study in Varna, which was received pretty enthusiastically but with the difficult question of "when". Art Berkey speaks for the Varna Community Association. Two of us spoke about the problems of the expanded map and uses of the commercial zones. I'll write mine up in my next post (and I was wrong about one piece of it). Vladimir Dragin (of the amazing Book Barn of the Finger Lakes) asked hard questions about why exactly it makes sense to extend commercial districts along Route 13 in an area the Town's been working hard to protect by purchasing development rights. He also pointed out potential traffic issues that could be created by connecting 13 to North Road through driveways. Deb Shigley asked about the Workshop/Garage question I'd also had, and I'm happy to report that the answers were all of the "we meant to fix that earlier and we'll make sure it gets fixed" variety. She also asked about seemingly contradictory parking rules around paving, pointing out that the definitions section of the document needs work. Nancy Munkenbeck suggested easing the limitations on what you can do in Rural Residential districts, a list I think I need to go through in much greater detail. In particular, I liked her bringing up churches that are no longer in use and how these prohibitions would make it really difficult to reuse them for anything other than housing. There were lots of questions about conservation subdivision, and many doubts about how restrictive the process would be. I have to admit that I've still not really figured out how it works, and I'm not sure that last night really helped me with that. 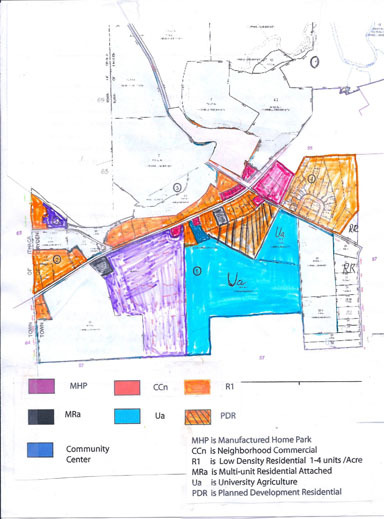 On the one hand, it seems designed to minimize the amount of development in sensitive areas; on the other hand, conservation subdivision was mentioned as an optional way to get units into a plot in the Rural Residential and Rural Agricultural zones. I'm left wishing the Planning Board had followed earlier proposals to sort out the subdivision work first before tackling zoning as a whole, though I know they're intertwined. Bruno Schickel, who had written a piece opposing the earlier proposed zoning, continued his press on the zoning proposal as too restrictive. He was the only person I heard call for increasing density in Varna beyond the recent increases, but he also had lots of questions about the general drift of the law, conservation subdivisions, and the process. The Planning Board will discuss passing the draft law to the Town Board at their meeting next Thursday, the 29th. Town Supervisor Mary Ann Sumner said that she "would love to wrap it up by the end of the year", a prospect I don't think most of the audience was enthusiastic about. There will be at least one more public hearing on the law. I'm sure I'll disagree with Jim Crawford about the details of zoning when we finally get there, but for now, I think he's right. Slow down, and focus on getting the part of the Town that wants detailed zoning right. Zoning is supposed to last for decades, and though it can be amended, the kinds of questions asked last night raise hard questions about the overall approach, not just the nits. Update: I've posted my imperfect recording of the meeting (37.6MB QuickTime). The first hour is mostly the presentation by Environmental Planner Dan Kwasnowski and consultant Mike Behan. I think it's comprehensible without their slides. Public comments start around 1:04 into the recording. The whole thing is about two hours and forty minutes. When I first looked over the new draft of the proposed zoning law, I expected not to love the hamlet zoning. The response to the Lucente proposal had been much more eager than I was happy about, and I wasn't surprised to see higher densities creep in there. I was startled, though, to find that commercial zones looked a lot like the densified hamlet zones, and that they'd spread far more widely across the Town - a band along 13 even to the northeast of the Village of Dryden, with odd freckles of commercial zoning between the villages of Dryden and Freeville. The 2005 Comprehensive Plan suggested a possible overlay zone on Route 13 to accomodate the complicated and problematic mix of uses that had developed there. The Route 13/366 Corridor study suggested avoiding further growth along 13, instead concentrating new housing in the Village of Dryden, Varna, and a possible "new node" at NYSEG. The current plan says what the heck and encourages denser mixed use across all of those areas, plus further to the northeast along 13. If it's put in the right place, higher density housing is a great idea. Increasing density is what makes cities vibrant, makes transit systems possible, allows more efficient use of resources, and, done right, makes it easier for all kinds of people to live together while finding the opportunities that excite them. If it's put in the wrong place, higher density housing creates isolated commuter communities without a whole lot to offer their residents. Water and sewer and a bus stop are basic foundations, not cause for rejoicing. Coming home to a townhouse in a neighborhood with shops and parks and schools and bars can be very exciting. Coming home to a townhouse that has nothing around except other townhouses and maybe a commercial strip is still coming home - but it has few of those shared advantages. The good news is that densities of more than one unit per acre (and less than ten) can't happen until water and sewer lines reach an area. The bad news is that lots of these places are not too far from those lines, often closer than Etna, which had frequently been marked for future development. Development pressure had seemed fairly slow lately until this year, when developer after developer in Tompkins County seems to be putting new plans forward. The current zoning draft could have been an opportunity to ensure that development proceeds smoothly in Dryden. Instead, it's become more of an invitation for developers to build isolated clusters that complicate traffic patterns, offer their residents few amenities, and will become ever more isolated should gas prices rise. I'm not really sure why the Town wants to encourage such patterns of development well beyond the "nodes" it keeps discussing. This is not the Ithaca we have come to know and respect. A community where differences and frayed feelings, even over the fatal shooting Bangs was involved with in the line of duty, are dealt with peacefully and rationally. In Ithaca, we pride ourselves on disagreeing, sometimes vehemently, but relying on our intellect and our words, not an act of arson. 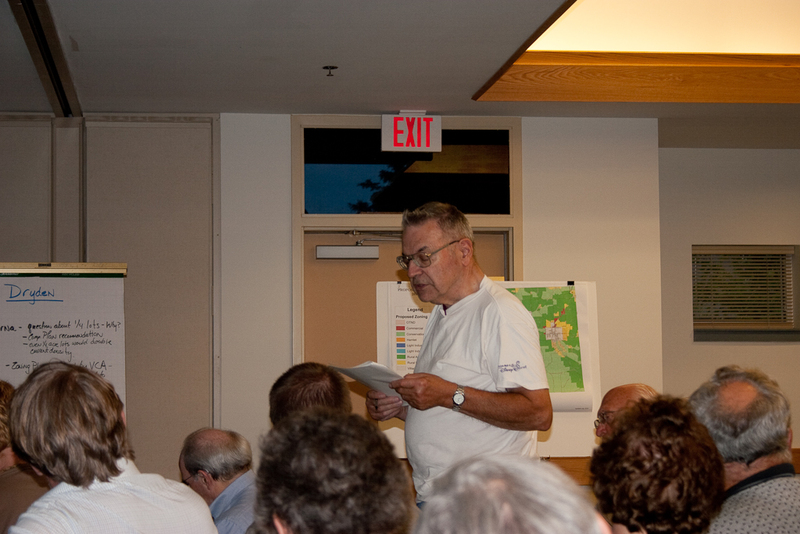 Back in 2007, Stan Marcus talked a lot about the Emerald Ash Borer during his campaign for Town Board. He was prescient - not only is the beetle on its way, but municipalities are going to have to deal with the many trees it will kill. Residents will too, as the infestation spreads - I have ash all through my back yard. Now it's in Steuben and Ulster Counties. Habitat for Humanity needs volunteers to work on a house in the Village of Dryden. I'd thought that the latest NYSEG rate increase proposals had been scaled back, but this doesn't feel very scaled back. An extra $17 a month is a big chunk of my NYSEG bill. Update: I'd left off a few residential uses, notably the home occupations, so added them in. I'll be taking a closer look at the Allowable Use Groups Chart, §501 of the draft Dryden zoning. Before I got too deep, though, I thought it might be interesting to get a broad (and not necessarily accurate) sense of how acceptable uses might be. Permitted 5 Maximum value, of course! Permitted on State and County Roads, Special Use Permit on Town Roads 4 Permitted many places! There are six basic zones - Rural Residential, Rural Agricultural, Conservation, Hamlet, Commercial, and Light Industrial Office, including LIO-A. (LIO-A is the area by 84 Lumber where Adult Uses are possible.) I counted them all the same for this rough calculation. That means the "most acceptable" score is 30, for uses permitted in all zone, and the lowest is 1, for a use only allowed in part of a zone. "Library" was the biggest surprise to me, at 4, but I'm sure other things will surprise other people. You're also welcome to download the spreadsheet and play with it yourself. 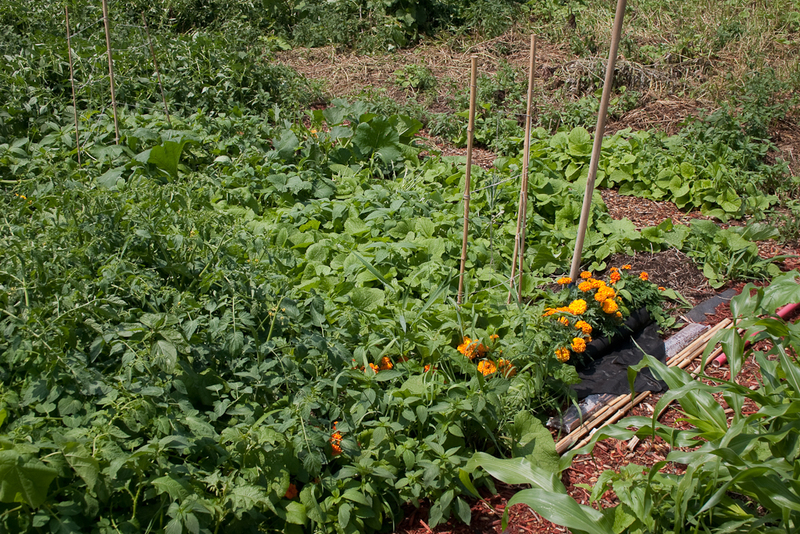 I finally got to visit the Dryden Community Garden this week, and was amazed. It's in a beautiful spot behind Town Hall, and though it's just getting started, it's promising and then some. 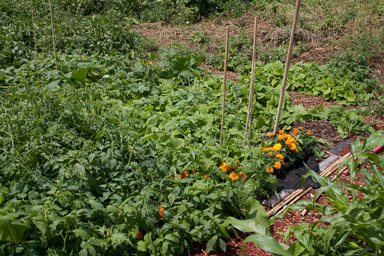 Plots growing in the garden. They'll be having a work day and meeting this Sunday at 1:00pm, working on paths and clearing unused plots. I've posted a lot more pictures in a a gallery, showing more of how to get there and the mostly beautiful views around it. The Dryden Beautification Brigade received a laurel for its for its Open Gate Garden and Art Tour last Saturday. It was a pretty calm time at the County Legislature, with lots of unanimous votes. No more articles today, just some happy pictures. "In the conventional world, it's all about volume and efficiency," he said. "Organics is more about taking care of the farmland and the animals." They also take a look at the "hey, don't look at Albany! Abolish your own government!" law and special districts in particular. Update: I've created an updated version of this table that includes the new Neighborhood Residential zone. One of the more frustrating aspects of the zoning conversation is that a lot of people think we're going from "not very" zoning to something much much stricter. The reality is a lot more complicated than that, but very tricky to pin down. The two laws aren't precisely comparable, even on basic questions like which uses are allowed. The maps have some similarities, but a lot of differences. I've put together a big table that includes the table of allowed uses from the July 2010 draft and also shows those uses for the older (originally 1988) zoning currently in effect. Creating that table was complicated by the very different structures of the two laws, and the different definitions they used. In many cases, the new law defines things that didn't exist in the old law, and sometimes creates larger categories. The old law, for example, mentioned golf courses, which is likely "Recreational Facility, Athletic" in the new law, but that doesn't mention golf. Similarly, libraries are a separate category in the new law, but unmentioned in the old. The old zoning districts don't correspond neatly with the new either. To figure out what's changing for a specific area, you need to visit the old map (image or PDF), and figure out what zone the parcel is in. Then you need to visit the new map (image or PDF) to see where it's going. Then you can figure out how allowed primary uses are changing there. Also, in the new zoning, there are overlay districts that don't fit into the table. The Optional Traditional Neighborhood Development Overlay Districts (OTNDO) are on the map, but not in the table. If you live in Etna or near the Village of Dryden, you probably should take a look at that definition to see what it might mean for you. I've also left Elder Cottages out. I need to read the new and old laws to figure out what's going on there. It doesn't neatly fit these tables, and the rules have always seemed strange to me. One feature of the old zoning law deserves special mention. The M-A zones - manufacturing - include a provision that permits any non-prohibited and non-allowed use to be included by Special Use Permit. That's why some of the unknowns in the table are still marked ? SUP. 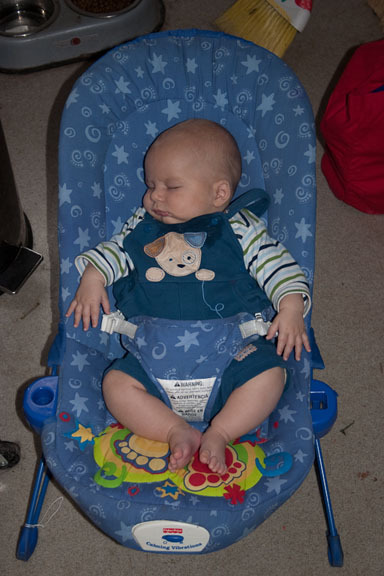 This is only the allowed uses table - this doesn't cover difference on subdivision, signage, density, parking, etc. Hopefully it's a start, though. Inn SUP SUP SUP SUP P X X X SUP SUP P As motel? Bed-and-Breakfast home SUP SUP SUP SUP SUP X X X SUP SUP ? "Tourist Homes?" Home Occupation: Level 2 P on state/county roads, SUP on Town P - State & County Roads X X SUP P P X Two employee limit. Library X X X SUP SUP X P P P P P 'Community building'? Religious institution SUP SUP SUP SUP SUP SUP P P P P ? Please let me know if you see anything interesting or wrong. Should the zoning advance from the Planning Board to the Town Board? As I think is pretty clear by now, I'm not a fan of the latest zoning proposal. Last Thursday's meeting made it clear that even the people most looking forward to new zoning aren't delighted. The Planning Board votes Thursday night on whether to pass this proposal on to the Town Board. At this point, I'm certain that the proposal needs cleaning up, but I'm not sure whether that is better in the hands of the Planning Board or in the Town Board. The Town Board has lots of other things to do, and I worry that they'll have a hard time focusing on it. At the same time, the Town Board is elected, and as a result closer to the immediate mood of the Town, so there might be more incentive there to address as much as possible. It's a hard question. The one thing I absolutely don't want to see is for this to go to the Town Board and be passed in about the same state as it is now. 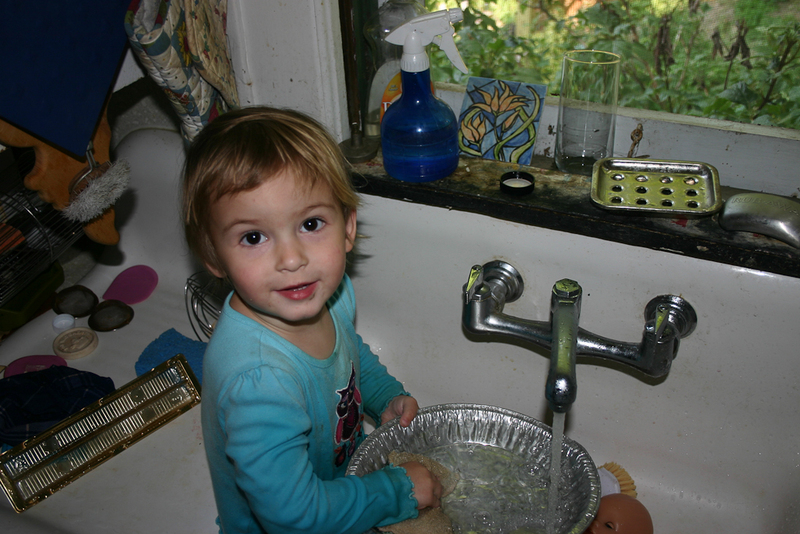 Tompkins County has created a list of all of its programs (1.3MB PDF). This is the kind of thing I'd like every level of government to do - track down and make public the programs they spend money on. Reading budgets is rarely fun, and this looks actually useful. Apparently Canada Geese across the state will be under fire soon. Hunting them (and eating them) is fine with me, though I'm not really thrilled with the 'grab, gas and bury' approach they're talking about Downstate. I also wonder how much reducing the population in western New York will do much to reduce the numbers in New York City, whose airports have problems. Connecticut and New Jersey seem more likely to matter. Update: Apparently at the Ithaca airport, right on the Dryden/Lansing line, deer are the bigger threat. That couldn't have been a fun landing for either the plane or the deer. Cathy Wakeman's Dryden Town Talk visits Junior Fire Academy, a week of drills, training, and competition for 10 to 16-year-olds. She also reports on Music in the Park and Music in the Hollow, plus the opening of the 4-H Fair today and the upcoming Healing Harps service at Reach Out for Christ Church. The New York Comptroller reports unsurprising news: time are getting harder for local government. In a sign that local developers building high-density housing can bend - especially when faced with neighborhood and government opposition - developer John Novarr substantially redesigned his Collegetown Terrace project along State Street in Ithaca. We'll see if Stephen Lucente's upcoming announcements for Varna carry any such similar improvements. I'll have more on tonight's Planning Board meeting, but the main action happened in the first five minutes. 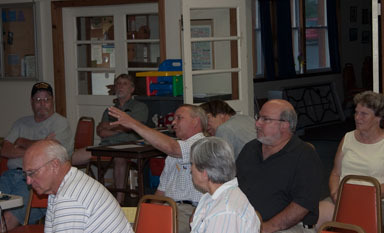 The Planning Board voted to send the draft zoning to the Town Board, with recommendations that a master plan for Varna be undertaken, that a joint group of Town Board, Planning Board, Zoning Board of Appeals, and Conservation Board members go through the draft again, and that more public input be solicited. I'm not entirely surprised - as Town Supervisor Mary Ann Sumner put it, they're in the fourth year of a project they thought would take three years. However, I certainly hope that the Town Board process will take a hard look at the entire zoning draft and make it more palatable. It's not nearly there yet. The Town Board has to have at least one more public hearing, and it sounded like they'll be having more sessions, maybe some focused on specific subjects. We'll see how it all goes. Update: I've posted audio of the meeting (12MB QuickTime). Fire investigators had a little canine help when they determined that the fire at Bryan Bangs house was arson. His gray coat, inquisitive eyes and friendly disposition invite smiles and pats. But it's that black nose that makes Shadow so special. This silver Labrador is used as an accelerant-sniffing dog and works as a state fire investigator. Shadow searches for the material used to start a fire to help determine if the blaze was arson or accidental. One of his most recent tasks was the July 10 arson at the home of Ithaca Police Sgt. Bryan Bangs, who was exonerated in June in the fatal shooting of a convicted Ithaca drug dealer. There's also a letter wondering if Bangs' house should have been better protected. It looks like the TCAT bus system will be draining its reserves to stay afloat next year. Norwich is a few miles down the road, but you may still want to keep an eye on your tomatoes and potatoes.